For many years, archaeologists believed that the first complex societies in South America must have developed along the seashore then spread inland. In 2001, however, Dr. Ruth Shady Solis, a Peruvian anthropologist and archaeologist, and two American colleagues, Professors Jonathan Haas and Winifred Creamer, published the results of their research during the 1990s at a site known as Caral in the Supe River Valley. 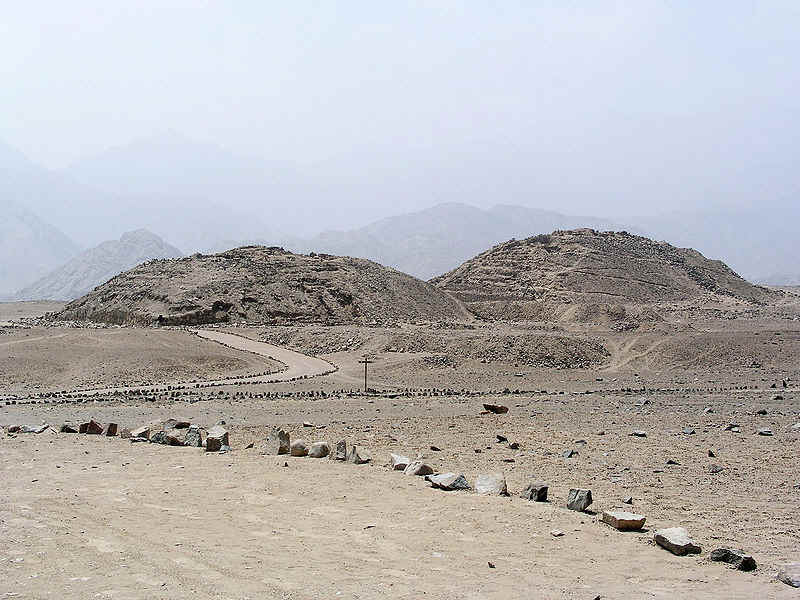 Although the site at Caral had been known since 1905, no one had done serious excavation work until 1994, when Dr. Shady began a systematic exploration. The results were astonishing - according to radiocarbon dating, the great pyramidal and platform structures of Caral had been built as early as 2627 B.C. The earliest evidence for civilization in the Americas had suddenly been pushed back a thousand years. At roughly the same time that ancient Egyptians were building the pyramids, across the world another group of peoples had also begun to organize themselves into a culture that produced magnificent monumental architecture and a fairly complex level of social organization. The earliest evidence of civilization that archaeologists have so far discovered in the Americas lies in a series of river valleys and along the coast of north-central Peru - the Chancay River, the Huaura River, the Supe River, the Fortaleza River and the Pativilca River - collectively known as Norte Chico civilization, or Caral-Supe civilization, after the largest inland site. As in Mesopotamia, the climate and landscape is a harsh one. Thanks to the height of the Andes and the nature of the prevailing winds off the coast, the narrow coastal plain of Peru received little rainfall and was often subject to severe droughts. The only significant freshwater sources available were the small rivers that flowed out of the mountains and down to the sea. Considering the desert nature of the region, significant agriculture along these rivers required the development of extensive irrigation. Even then, survival in anything more complex than a hunting and gathering style required the organization and exploitation of a variety of resources. Unlike other early civilizations, the Norte Chico peoples did not, apparently, depend on any form of grain that might be stored for future use. Even with irrigation agriculture, the primary agricultural foods were squash, beans and guava. In addition, they also grew cotton. The primary sources of protein came from the coast, some 14 or 15 miles downstream, particularly anchovies, sardines, and a variety of shellfish. Early Peruvian communities. Most scholars believe that by around 8500 B.C., hunter-gatherers lived in small settlements on the coastal plain of Peru where they also fished and farmed to supplement their diets. Based on early discoveries, particularly the site at Asperu, for many years archaeologists believed that the first complex societies developed directly on the coast, probably out of the need to organize in order to obtain sufficient food supplies from the sea. Over time, it was thought, these villagers developed links to others farther inland, exchanging fish, shellfish, and salt for highland crops, such as cotton, and bird feathers. On the basis of the archaeological remains, it is not entirely clear whether the buildings at Caral represented a true city or simply a large ceremonial center for the surrounding peoples. The Norte Chico people did not build vast cities, but they did construct numerous ceremonial, possibly religious centers, that included some residential areas. Their sites include pyramidal structures, sunken plazas, residences, and storage areas. By 1800 B.C. a new style of temple architecture had appeared at El Paraiso, near the present-day city of Lima, Peru. There the temple-builders constructed at least six temple buildings laid out in a U shape around a giant plaza. Although scholars know very little about the religious beliefs of the people who used these temples, the differences in architectural styles suggest that the people of each area may have had their own system of beliefs. Chavin de Huantar. One of the best-known sites of prehistoric Andean civilization was discovered in A.D. 1919 near the small village of Chavin de Huantar. Located in the foothills of the Andes Mountains, Chavin stood at the crossroads of several trade routes linking the mountains with the coast. This strategic location may have been why the site developed into a ceremonial center of some importance. Its distinctive culture spread over a wide area along the northern coast and the northern highland region of Peru. Chavin de Huantar flourished between about 850 and 200 B.C. In its early years, Chavin was a small village and shrine, but by the 300s B.C. the village had become a rapidly growing town, probably famous over a large area for its religious shrine and its production of religious objects. Artisans in Chavin decorated seashells with feline patterns and made ceramic objects used for religious purposes. Some scholars believe that the Andean people had two major gods. The first was a "smiling god," a half-human, half-feline creature with the body of a man and head, hands, and feet of a jaguar. The other was a "staff god," a snarling manlike figure wearing a serpent headdress and holding two staffs with feline heads and jaguar mouths at their ends. Like the Olmec, the Andean people also considered the jaguar an important religious symbol. Many scholars believe that the first civilization to develop on the North American continent was in Mesoamerica, where abundant rainfall and a warm climate allowed crops to be grown year-round. This civilization, which archaeologists call the Olmec, emerged sometime around 1500 B.C. from small settlements that dotted the swampy lowlands of what is now the Mexican state of Veracruz. During the rainy season, the rivers flooded and deposited silt along their banks, much the same way as on the Nile. The Olmec heartland was therefore one of enormous agricultural potential. San Lorenzo and La Venta. Two Olmec archaeological sites, San Lorenzo and La Venta, provide most of the knowledge that scholars have about the Olmec. Settlers first built small villages in the area of San Lorenzo around 1700 B.C. By about 1500 B.C. the Olmec had built a huge gravel platform, upon which they constructed San Lorenzo itself. The site consisted of small pyramids, a grouping of earthen mounds, and a rectangular courtyard, which archaeologists believe may have been the earliest ball court in Mesoamerica. At this site, which flourished between 1200 and 900 B.C., the Olmec placed ten huge heads carved of basalt, a type of rock. These heads may have been portraits of Olmec rulers. Scholars believe that San Lorenzo was a ritual center to which people came from miles around. At La Venta, the other major Olmec site, archaeologists have discovered ruins of an extensive complex, including a pyramid, temples, and plazas, as well as the remains of monumental stone sculptures. Radiocarbon dating has established that La Venta reached its height between 1100 and 600 B.C. Olmec society and culture. Olmec society was divided into at least two classes of people. Most people were farmers, who tilled the poorer soil of higher elevations to raise two crops of maize per year. The elites of Olmec society were a small minority that had power over governmental, military, and religious matters. These elites controlled the richer lands along the rivers, which pro­duced a much larger harvest than the highlands. Everywhere there are archaeological treasures that lie hidden in the jungles… burial mounds and pyra­mids, masterfully carved colossal monuments of basalt, splendid statuettes of precious jade, and sensitively modeled figures of clay, all of an unprece­dented, high artistic quality. The end of Olmec society. Scholars disagree about how the Olmec civilization came to an end. Some scholars believe that Olmec civilization ended in violence. They suggest that San Lorenzo was destroyed around 900 B.C. and La Venta was crushed around 400 B.C. These scholars have not been able to determine who the destroyers were, however. Other scholars believe that Olmec society came to a more gradual end. They suggest that San Lorenzo declined slowly from about 900 to 700 B.C., and that La Venta faced a similar fate between 450 and 325 B.C.